Such a lovely old-fashioned-looking boat that turned Munn Lake into an idyllic scene on Friday afternoon. 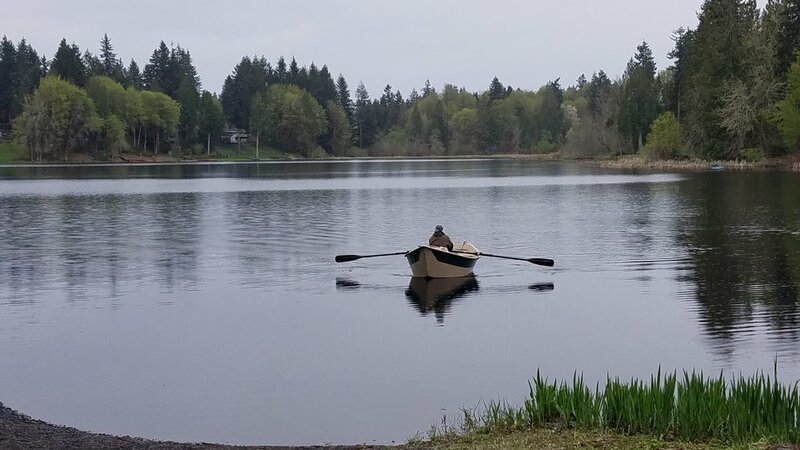 After just four early-season swims in Munn Lake, just south of Olympia, I am feeling more comfortable getting into and swimming in cold water. “Cold” is getting warmer in this lake. My first swim, on March 21, was in 52 degree F water. The water (at least in the shallows) was 60 degrees F today, though it seemed colder without the sun and with the air temperature only in the upper 50s. My friend and I usually use the concrete slab boat ramp to enter the water, but this darling little rowboat was coming ashore and its owner was going to be using the ramp to trailer the boat. To make sure we were out of his way, we moved with a bit more alacrity that usual. Which was a good thing. It meant we didn’t dawdle on the shore. We splashed water on our faces (a trick to help reduce the shock of the cold water on the rest of your body) and were fully immersed in under five minutes. My friend and I worked our way to the middle of the lake with a combination breast stroke (head above water) and crawl. At first I could do about 10 strokes before my face hurt. But then, as my skin numbed, I could do 30. But my legs were also numb and my muscles fatigued quickly and I my breathing was becoming a bit more labored than I like. Being sensitive to your own comfort and capability in cold water is essential and I felt no need to push myself into the hypothermic zone. Splashing water on your face helps with the entry into cold water and sipping hot tea helps with the exit. I like to keep a thermos of hot rooibos tea and few cups in the car. Warming up the core from the inside (instead of from the outside with a hot shower) is best immediately after a cold-water swim. Once I warmed up back at home and looked at my photo of the little fishing boat, I realized how much it looked like a water boatman—the aquatic insects that have long oar-like legs that help them move across and under the water with natural grace. Look how fun water can be in in its liquid state! The lakes around the Grand Coulee Dam in eastern Washington attracts crowds of recreational boaters, fishers, swimmers, and frolickers in summer and fall. One hot, dry September nearly a decade ago, I traveled with two friends to swim in the lakes south of the Grand Coulee Dam in eastern Washington. We spent hours in both Lake Lenore and Banks Lake swimming in the refreshingly cool water after long hikes in the dry, cactus-loving hills above the lakes. And I do mean swimming—crawl, breast stroke, back stroke—not just dipping into the shallows to cool off. Ten years ago, I was newish to Washington and to the story of the Missoula Floods that shaped this strange landscape. I remember being impressed by the strange basalt cliffs and asking my family to imagine the boulder fields of Joshua Tree National Monument laid out in the bottom of the Grand Canyon and then to imagine the canyon flooded with water to leave the tops of the boulders exposed. That’s what it was like swimming in these lakes. When I turned my head to breathe while swimming in Lake Lenore, my face was inches from the sheer basalt walls. In Banks Lake, you could swim into a maze-like cove strewn with sun-warmed boulders, crawl out onto a boulder to warm up, then slip right back into the water. But I had since forgotten exactly where that Banks Lake cove was and I wanted to swim there again. After a spate of unseasonably warm March days in Olympia, I packed my wetsuit and my husband and I strapped the canoe on the car for a weekend at the lake. Alas, Banks Lake was not how I remembered it. Why didn’t anyone tell me it got really really cold in eastern Washington in winter? Photo by M.D. .Ruth. Yes, that’s ice. Except for the liquid water along the nearshore, Banks Lake was frozen. Yes, I could have found this out with a simple phone call, but it was inconceivable to me that all that water could have frozen at all or could still be frozen. Though I’ve been living in Washington for 12 years, I am still very newish to eastern Washington. I was disappointed but luckily, there was a vast landscape to explore by foot and car. There was much geology to see and understand. And I was happy to embrace the legacy of the Missoula Floods without installing an ice-breaker on the prow of our canoe or getting hypothermia. Embracing the Missoula Floods meant doing my homework and reading a few of the excellent books on this subject. It meant studying the interpretive signs posted along the highways that lead from Soap Lake to the Grand Coulee Dam along Highways 17 and 155. It meant asking my husband (the geology major) lots of questions he cannot answer because it’s just too incredible. And—most importantly—it meant giving my imagination plenty of time to expand to take in the scope and magnitude of the floods. Next Blog: Why Banks Lake is a lake and why it is where it is. This is what 52 degrees F looks like. It feels much better! 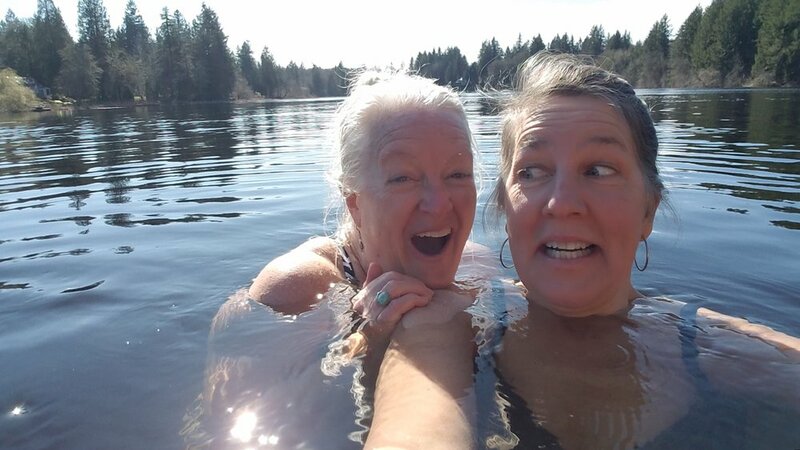 What better way to celebrate the vernal equinox than to tiptoe into a local lake with a friend and fellow cold-water enthusiast? It was a spontaneous plunge—planned just minutes before the official moment of spring at 2:58 p.m. Pacific Daylight Time. With the air temperature in the low 80s in Olympia today—and cooling back down to the 60s tomorrow, it was a carpe diem kind of event. I had been to my local Y in the morning with my new swim goggles and plan to see if I could swim for an hour without any significant breaks. Surprisingly I could. It was almost anticlimactic. I thought I would be struggling by the end of 45 minutes and would finish the hour feeling like I had preserved and really accomplished something. I swam for an hour and ten minutes and then I just felt done. Eventually, I’d like to build more speed, strength, and stamina so I can swim comfortably for an hour in open water. But there is a big difference between a lap pool and a lake (especially if its cold) and I wanted to work on getting acclimated to cold water so I could enjoy a long swimming season this year. I didn’t want to wait until the summer solstice to start. So why not see how cold a cold lake feels right now? A few e-mails back and forth with my friend and we were off to Munn Lake, at the south edge Olympia. There were just a few fishermen on the lakeBetween the two of us, had two enormous towels, one wetsuit, two big fleecy sweaters, one hotpot of water for tea, two mugs, one thermos of coffee with Kahlua, and Discover Pass, and one very excited golden retriever. And a thermometer for testing the water. It was 52 degrees F. Bracing? Refreshing? Painfully cold? It was hard to tell. 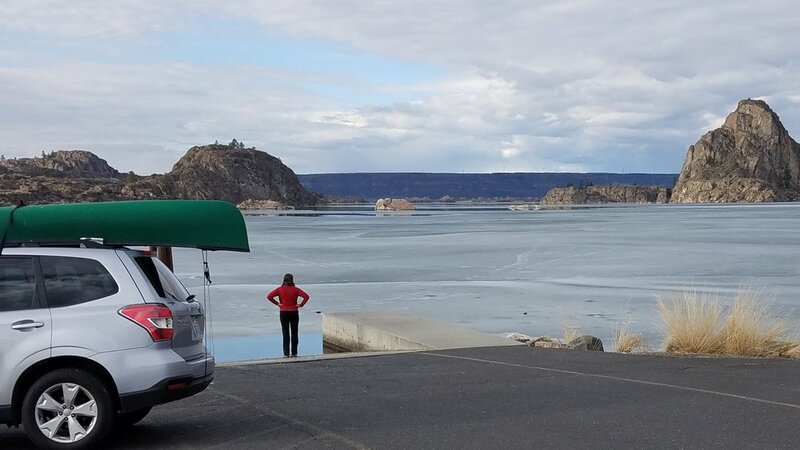 I wasn’t sure I was going to get all the way in the lake, but my friend just peeled down to her bathing suit and started walking down the submerged concrete boat ramp. Just like that. I announced that my goal was to get in slowly, eventually, and not scream or use any swear words. By the time my ankles were wet, my friend was already in up to her neck, smiling. “It’s lovely! It’s hard on the arms, but otherwise perfect.” She looked like she meant it. So I tried to follow suit. The longer I stayed above the water, feeling the unseasonably warm sun on my skin, the colder the water felt. Forward, ho! My legs numbed quickly, I splashed water on my arms, winced, then pushed off the last concrete slab and was in. It was…not bad. There is definitely a timing trick here. Plunge in to quickly and you could shock your system (heart) in a dangerous way. Too slowly and you are letting matter get over mind, giving yourself too many opportunities to change your mind, lose your resolve, and retreat to your big warm towel and steaming cup of hot something. I turned on my back and floated myself up the surface of the water to take advantage of the relatively warm water and the very warm sun. Now it was delightful and I relaxed into the lake, into the landscape, into an afternoon that was the fulfilled promise of Spring. Looking warmish, but not exactly relaxed, after a90-minute summertime swim around and across cool Josephine Lake on Anderson Island, WA. “Wild swimming” and “open-water swimming” both take place in lakes, ponds, rivers, bays, and oceans, with “cold-water swimming.” Cold-water swimming takes places in natural bodies of water, too, but it is accompanied by xtreme bravado and/or a wetsuit, yelping and/or cold-water acclimatization training, and the risk of both hypothermia and euphoria. At least this is what I thought. This winter, I have read Lynne Cox’s Swimming to Antarctica(not a metaphorical title). I’ve watched many videos of crazy-happy people dipping into icy lakes in Speedos and wool hats. I stood idly and warmly by while 300 people jumped off a dock and into a lake during the New Year’s Day 2019 Polar Bear Plunge. The water as 40°F that day. No one really “swam,” but they were immersed in that water for at least 30 seconds, which counts for a lot in my book. The Polar Bear Plungers looked ecstatic as they waded back to shore—either because they were glad to be done or because they had quickly reaped the benefits of a dip in cold water: adrenaline rush, exhilaration from increased endorphin levels, and reduced cortisone levels. Or they knew that they would later benefit from increased mental fortitude and clarity, boosted immune system, supercharged metabolism, reduced inflammation, less pain from rheumatism, fibromyalgia, and asthma. What’s not to like about cold-water swimming? Just some of the 300 swimmers who joined the New Year’s Day 2019 Polar Bear Plunge in the extremely-cold-by-any-standard Long Lake, in Lacey, Washington. You have to get into cold water. But how cold is “cold” water I wondered. “Cold” is very subjective, it turns out. Some people consider water below 70°F “cold.” Others use a standard of 64.4°F to define “cold”—or really “too cold.” This is the temperature at which hypothermia is believed to set in for those people not acclimatized to this temperature and who are suddenly immersed in such chilly water, typically when cast overboard from a boat. Some rare swimmers are acclimatized and habituated to swimming as low as 45°F and do not become hypothermic. Is 45°F “cold” or “too cold” for them? Cold? Cool? Bracing? Refreshing? Too Cold? It’s up to you to decide. Because I am planning to write about the natural and human history of several lakes in Washington, I wanted to be prepared for swimming in them when I did my “field work.” I figured I would have to work hard to join the ranks of the elite open-water wild swimmers who frolick in those 45°F waters year-round. I was dreading it. I worried about not only becoming hypothermic but also about just being plain uncomfortable. But wait! I swim in cold water! I’ve swum in the Tenino Quarry Pool for crying out loud! The water temperature is between 50 and 55°F. In 2018, I swam from April to October in lakes and rivers around western Washington. I doubt any of them were over 65°F. Only once did I feel the water was too cold and that my safety was at risk. I returned to shore as quickly as my sluggish body would let me. The perception of cold is influenced by many factors: Air temperature as well an individual’s acclimatization and habituation to cold water, physical condition, body size and build, body mass index, attitude, alcohol level, psychological makeup, swimming ability, can affect an individual’s response to the water. The importance of knowing how cold is too cold for yourelates to yoursafety, which is really about and how far and how quickly yourbody temperature drops and you become hypothermic. The temperature of the water and how long you are in the water must both be factored in. A 2-minute dip into 50°F water is one thing, but a 20-minute swim is another. Now that I have convinced myself (sort of) that I am not a wimpy swimmer or an Xtreme cold-water swimmer, I can stop worrying about the semantics and look forward to a long season of wild, open-water swimming in water that may or may not seem to be cold. I have to remember to carry a thermometer to test the water and air temperature before I enter a lake. And I have to pay close attention to how my own watery body responds to being in the water. Relaxing into a nice long swim is a valid response. So is yelping, swearing, and thrashing, and shivering yourself warm.